Figure 8.16A-D show the sequence of events that occur at the muzzle on firing a shotgun. Note the large gas cloud that is partly responsible for the severe nature of the wounds at contact range. 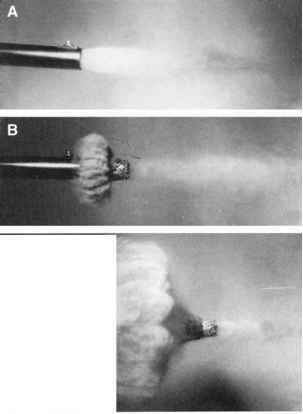 Figure 8.16 (A-D) Discharge of shotgun. 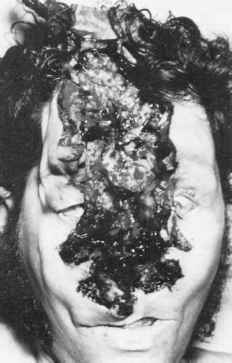 Contact shotgun wounds of the head are among the most mutilating firearms wounds there are. Extensive destruction of bone and soft tissue structures with bursting ruptures of the head are the rule rather than the exception. These are the wounds of which an individual is said to have "blown his head off." In some cases, this is almost literally true. The skull may be largely fragmented and the brain pulpified. Large fragments of the cranial vault and cerebral hemispheres are often ejected from the head. The scalp is extensively lacerated. The severity of the injuries in contact wounds of the head is due to two factors: the charge of shot entering the skull and the gas from combustion of the propellant (Figure 8.16D). The shot directly fractures the skull and shreds the brain while at the same time producing pressure waves that increase the severity of these injuries as well as ejecting the brain tissue. The gas, entering the closed chamber of the head, expands rapidly, adding to the pressure waves acting on the bony framework of the skull. The only way for the skull to relieve the pressure produced is to shatter. Most contact shotgun wounds of the head are suicidal in origin. In a study of 89 contact shotgun wounds of the head, Harruff found the most common site of entrance was the mouth (62%), followed by the temple (15%) and the submental region (13%).6 In the case of wounds of the temple, most right-handed individuals shoot themselves in the right temple using the left hand to steady the gun against the head. With similar sites of entrance, the internal injuries produced by shotguns of different gauge are very similar. This is not the case for external injuries. Harruff noted a marked difference in the external injuries depending on the gauge of the weapon used.6 In the case of intraoral wounds, in 74% of the cases in which a 12 gauge shotgun was used there were bursting injuries extending from the mouth to the scalp. For 20-gauge shotguns, only 9% of the wounds produced were this severe. Rather, 55% of the cases with intraoral wounds from 20 gauge shotguns had either no lacerations or the lacerations were limited to the perioral area. Only 8% of the cases involving 12-gauge shotguns showed this less severe pattern. In suicidal contact wounds of the head, individuals tend to use their dominant hand to depress the trigger, steadying the muzzle against the head with the non-dominant hand. 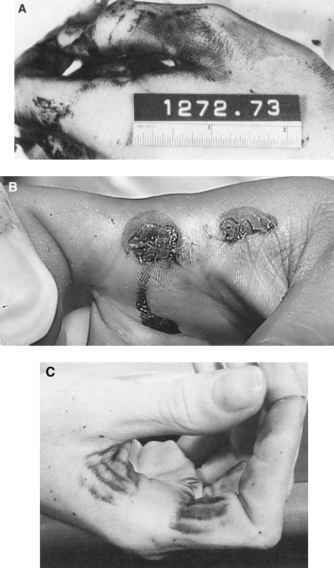 Because of this, powder soot may be visible on the non-dominant hand (Figure 8.17A). This is the exception, not the rule. In rare instances, there may be blowback of powder from the entrance with resultant tattooing of the web of skin between the thumb and index finger of the hand steadying the barrel (see Figure 14.9A). In other instances, this area of the hand may slightly overlap the lumen of the barrel and a graze wound from the exiting pellets and wadding may occur (Figure 8.17B). If a compensator was present at the end of the muzzle, a grid-like pattern of soot deposition may be present on the palm of the hand holding the muzzle (Figure 8.17C). Even if there is no visible gunshot residue, residue may still be present on the back and/or palm of the hand steadying the muzzle. Because of this, testing for residue by FAAS or SEM-EDX should be performed. Figure 8.17 (A) Soot deposit on hand used to cradle muzzle end of shotgun. (B) Graze wound. (C) Patterned soot deposit due to compensator. Although massive injuries of the head with evisceration of the brain are very common, they are not inevitable. The author has seen numerous cases in which an individual shot themself in the head with a shotgun and no pellets exited. Almost invariably, such wounds are inflicted in the mouth or under the jaw and not the temporal region. Even though no pellets exited, there are massive fractures of the skull and pulpification of the brain. The weapons in these cases ranged from .410 gauge to 12 gauge. In wounds where the brain is eviscerated, the great bulk of the pellets and the wad will exit. An x-ray of the head may show only 3 or 4 pellets remaining from a shell that held hundreds. Occasionally, people shooting themselves in the mouth tilt the head too far backward before firing. This results in their "shooting off" the face and sometimes the frontal lobes (Figure 8.18). In such instances, death may not be immediate. The author has seen individuals survive weeks with such wounds. One individual who shot off his face survived a number of months in a vegetative state only to die from meningitis due to an intracranial abscess that formed about a tooth driven into the occipital lobe of the brain. Figure 8.18 Intraoral shotgun wound. In the typical contact wound of the head, the entrance site is easy to locate, as large quantities of soot will be found at it. The edges of the wound will be seared and blackened (Figure 8.19). The entrance is often bisected by large lacerations extending across the top of the head. Fragmentation of the skull usually occurs. 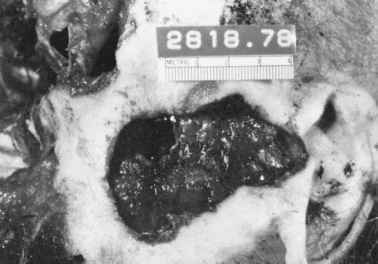 The exit site of the pellets may not be found because of missing fragments of bone and scalp; the massive comminuted fractures of the skull and extensive lacerations of the scalp. 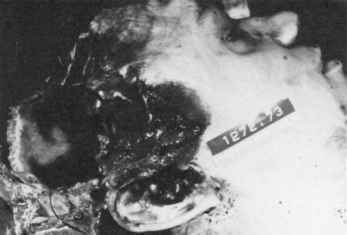 Figure 8.19 Contact wound of right temple with evisceration of brain. Note large amount of soot at entrance site. In intraoral shotgun wounds, soot is present on the palate, the tongue, and sometimes the lips. Stretch-like striae or superficial lacerations of the perioral skin and nasolabial folds often occur because of the sudden transient "bulging out" of the face, caused by the temporary cavity and the gas (Figure 8.20). Lacerations of the tongue can also occur. Although soot is seen around the entrance in most contact wounds of the head, this is not absolute. The author has encountered a number of cases in which no soot was seen either externally or internally (Figure 8.21). All but one case involved Winchester ammunition loaded with ball powder. In all but one of the Winchester cases, ball powder grains were readily identified in the wound. The most disturbing case involved an individual who shot himself in the temporo-parietal region with a 12-gauge shotgun firing Winchester birdshot. The suicide took place in front of scores of witnesses. The head injury was massive, with evisceration of the brain. Neither powder nor soot could be found on or in the head. Since not all the cranial contents were recovered from the scene, it is possible that a more diligent search would have revealed at least powder grains. Figure 8.20 Tears at corner of mouth due to intraoral shotgun wound. Figure 8.21 Contact wound of right temple with 12-gauge shotgun. Note absence of soot. Ball powder was recovered from entrance. ring. Stretch-like striae may radiate from the entrance as well. The exact site of the exit of the pellets, however, is often not apparent. Reconstruction of the shattered skull may be helpful. Contact wounds of the trunk appear relatively innocuous when compared with the massive destruction produced by such wounds in the head. The wound of entrance will be circular in shape and will have a diameter approximately equal to that of the bore of the weapon (Figure 8.22). In hard-contact wounds, no soot surrounds the entrance site, but the edges of the wound will be seared and blackened by the hot gases. The skin will not split, as in head wounds, because the gases disperse in the underlying soft tissue and visceral cavities. These gases, however, will cause the chest or abdominal wall to flare out abruptly, impacting the muzzle of the weapon with great force. This often will result in a detailed imprint of the muzzle of the shotgun. In double-barrel weapons, the imprint of the unfired barrel often will be present. The chest and abdomen may flare out to such a degree and with such force as to have impressed on them the outline of the hand holding the barrel or even a chain or medal that was present around the neck (Figure 8.23A). The flared-out chest or abdomen may envelope the end of the barrel so that an imprint of the front sight may be present, even though the sight is one inch from the muzzle. 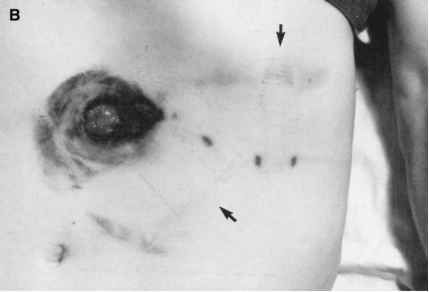 Figure 8.22 Contact wound of chest with seared edges. 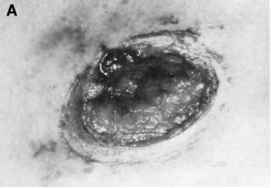 Figure 8.23 (A) Contact wound of chest without soot or powder but muzzle imprint. (B) Contact wound of abdomen with imprint of wrist and hand; note the watchband around wrist. entrance. 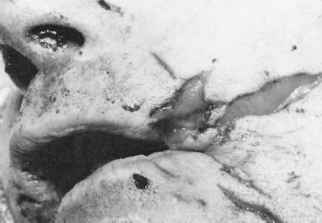 That the wound was a hard contact was easy to determine because of a muzzle imprint around the entrance (Figure 8.23B). The wound of entrance may be surrounded by a wide zone of raw, abraded skin caused by flaring out of the skin of the chest or abdomen around the muzzle at the time of discharge. The mechanical action of the skin rubbing against the end of the barrel causes abrasion of the superficial layers. If the muzzle of a shotgun is held in loose contact or near contact with the body, there will be a circular area of soot deposited on the skin surrounding the entrance hole. As the range increases, the diameter of the soot deposit increases, but the density decreases. Deposition of soot continues out to a range of approximately 30 cm. If the skin is reflected from around a contact wound of entrance, the underlying muscle will usually have a cherry-red hue from carboxyhemoglo-bin and carboxymyoglobin formation, with the source of the carbon monoxide (CO) being the gases of combustion of the gunpowder. CO is not necessarily confined to the immediate adjacent muscle but can spread 15 cm or more from the entrance. CO also may accompany the shot in its path through the body; if a large mass of shot lodges subcutaneously in the back, CO may produce a cherry-red hue to the adjacent muscle. Figure 8.24 Intermediate-range .410 shotgun wound of chest with ball powder tattooing. The deceased was shot through flannel pajamas. at 30 in. (75 cm), with a very few marks present at 36 in. (90 cm), but absent by 40 in. (125 cm). Just as in handguns, ball powder produces fine powder tattoo marks and can readily perforate clothing (Figure 8.24). All Winchester shotgun ammunition is loaded with ball powder while all Remington and Federal ammunition uses flake powder. The above data on range of tattooing is based on tests done in rabbits, whose skin is thinner than that of humans; therefore, these figures should be considered only as maximum ranges out to which powder tattooing will occur in humans. In addition, other factors such as barrel length, also have an effect on the maximum range and density of powder tattooing. As the muzzle of the shotgun is moved farther from the body, tattooing disappears and the diameter of the circular wound of entrance increases in size until a point is reached where individual pellets begin to separate from the main mass (Figure 8.25). From contact to 2 ft, birdshot fired from a shotgun, independent of its gauge (excluding the .410), generally produces a single round entrance wound approximately 3/4 in. to 1 in. in diameter. By 3 ft, the wound widens out to approximately 7/8 in. for a barrel with modified choke to 1 1/4 in. for a cylinder bore weapon. The edges of the wounds will have scalloped margins (Figure 8.26). By 4 ft, the modified choke barrel produces an entrance hole approximately 1 in. in diameter with the cylindrical bore barrel producing an entrance 1 3/4 in. in diameter. Scattered satellite pellet holes are present around the main entrances (Figure 8.27). By 6 to 7 ft, there is a definite cuff of satellite pellet holes around a slightly irregular wound of entrance for a shotgun with a modified barrel (Figure 8.28). For a cylindrical bore weapon, the wound is ragged with a prominent cuff of pellet holes around the entrance. Beyond 10 ft, there is great variation in the size of the pellet pattern depending on the ammunition used, the choke of the gun and most important, the range. At the same range, the pattern for different guns and brands of ammunition may vary from a central irregular perforation with numerous satellite wounds to a pattern of multiple individual pellet wounds.